Ultimate Lounging For All Patios - Jamie & Co. Many of us aren’t able to change the sizes and layouts of our patios or decks. We’re left to choose furniture and its arrangement, decide what to plant, and select other outdoor elements to make the space our own. Make tiny terraces feel larger and expansive decks more inviting with these tricks for styling your outdoor lounge. 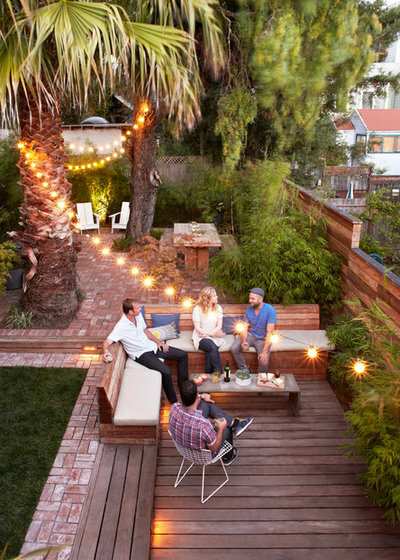 Great for: Hanging out on your own or with one or two other peopleIf you’re starting with a deck, patio or balcony with a small footprint, most design challenges center on how to maximize the space. 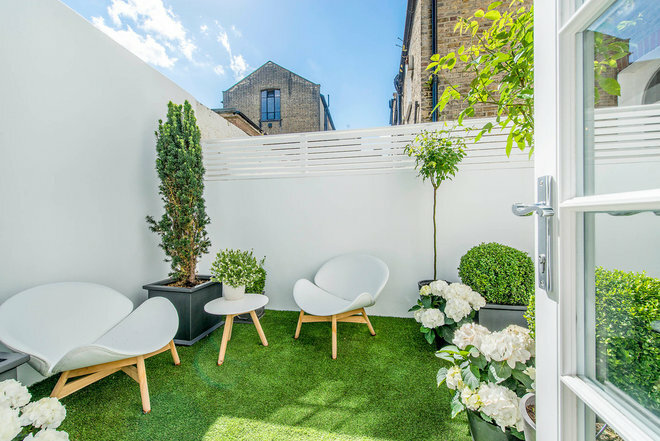 Steal a design trick from this contemporary terrace in London and stick to a light and bright color palette to visually open the space and make it feel larger than it actually is. 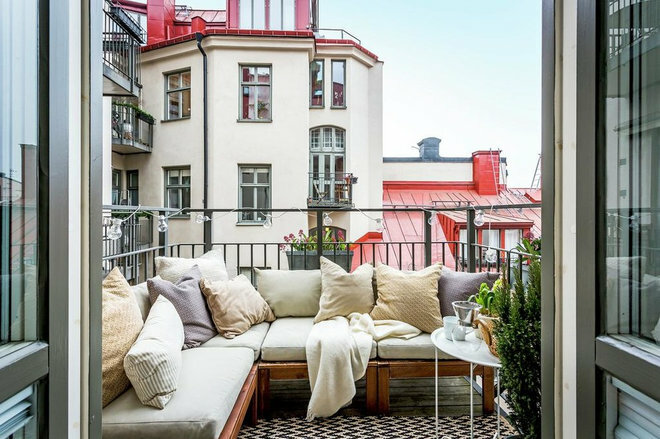 This cozy balcony in Stockholm makes an argument for getting the largest outdoor lounge your small patio will support. The homeowners squeezed a sectional sofa into their postage stamp-size terrace, creating enough seating to host a small group. Piles of pillows, a soft throw, a bistro table for drinks and a chevron outdoor rug make the space even more inviting. Hanging chairs can be a great option if you have an awning or covered porch. They make a bold design statement and keep the floor clear. A single cloud-gray egg-shaped chair hung in the corner of a covered porch looks almost irresistible, encouraging one to curl up with a good book. 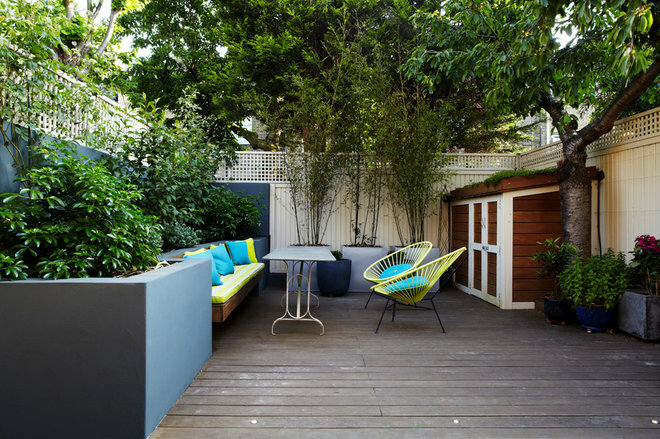 There are a few ways to approach a small, narrow space such as a skinny rooftop terrace or a side yard patio. 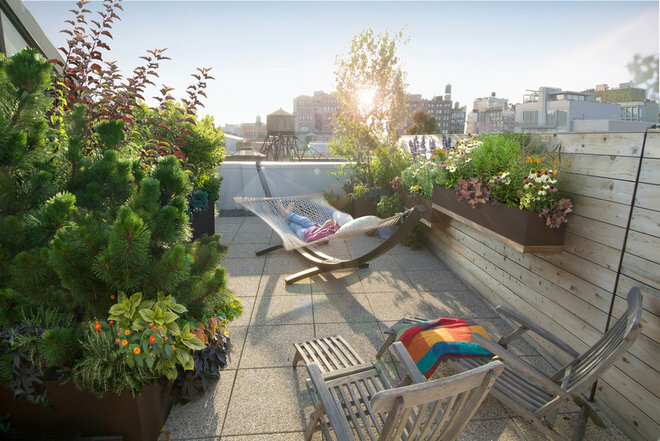 This rooftop deck in New York uses wall-mounted planters to save floor space and adds lounge chair seating that is long but narrow. 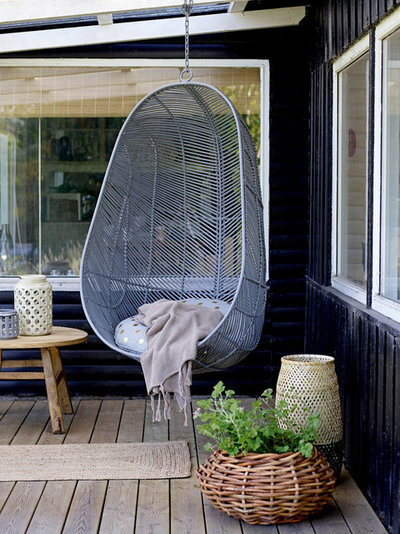 A hammock with a floor stand may not be practical to walk around, but it sure looks like a dreamy destination for an afternoon nap.Another strategy for narrow spaces is to use furniture, screens or medium-size plants to divide the space. For example, placing a bench seat running across the shorter side of a patio can help the space feel wider and less like a corridor. Great for: Kicking back with a small groupCombinations of furniture, such as a built-in bench paired with outdoor chairs or a sofa, often work well to allow flexibility, expand seating and open up more room for planting on medium-size patios or decks. The designer of this southwest London backyard built bench seating into the planter to save space and create a cozy nook for a couple of people. A folding table and a pair of bright Acapulco chairs can be moved in to allow seating for additional guests. 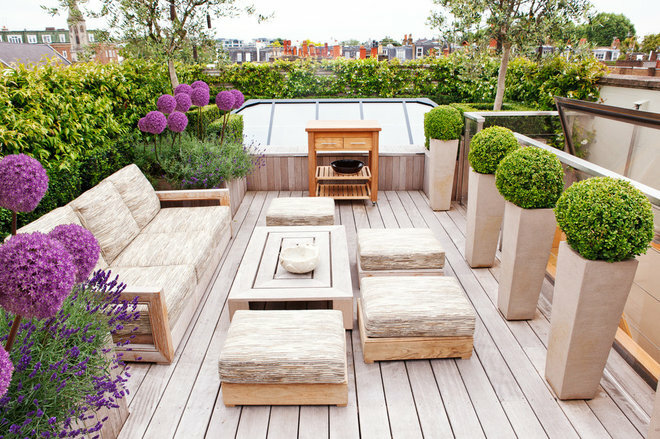 This medium-size roof deck in London’s Kensington neighborhood also uses a combination of seating options to comfortably accommodate up to seven people. 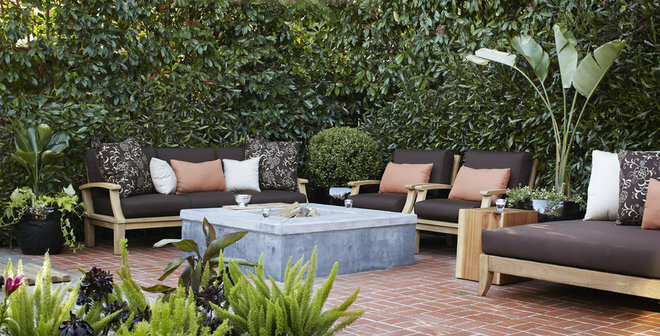 The designer included four cushy ottomans instead of a second outdoor sofa. 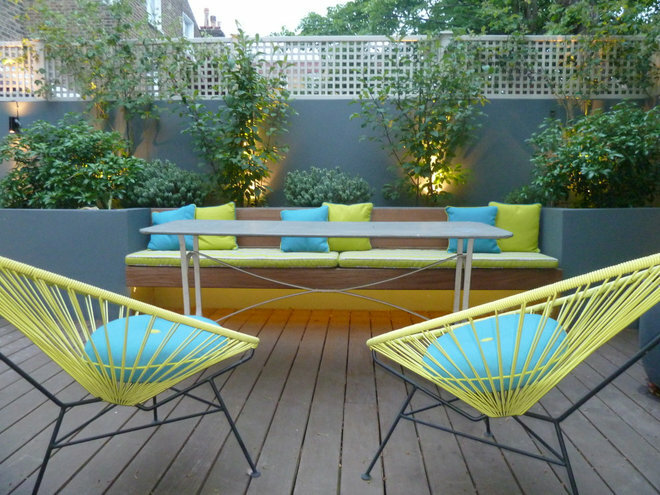 This keeps the seating arrangement flexible and views of the garden and rooftops uninterrupted. The low-lying ottomans also open up space for a row of boxwoods potted in tall planters, a pleasing design feature of the terrace. Decks that are 12 by 12 feet, plus or minus a foot or so, can be ideal for hosting a small group in a space that feels intimate rather than too spread out. If your existing hardscape feels larger than what you can use for a lounge, consider quartering off a section of it as a small group seating area.For example, this San Francisco backyard uses an L-shaped bench seat to define a lounge area around an outdoor table. The space feels cozy and inviting for four or five people to share a conversation. Great for: Hosting a backyard party for six or moreOne of the challenges of choosing the furniture layout and planting design for a large patio is making an expansive space feel more human-scale. For example, arranging large-scale outdoor seating in U-shaped or semicircular layouts, around a coffee table or fire pit, can make the space feel like a cozy, more inviting gathering place. 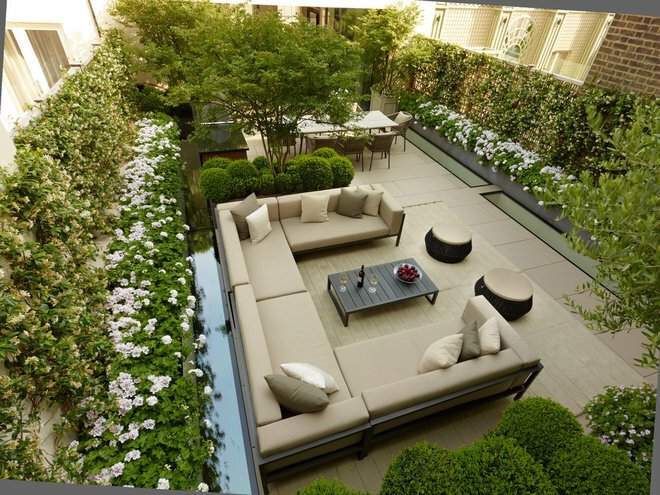 This expansive rooftop terrace in London, also shown in the previous photo, uses a U-shaped arrangement of sectional outdoor sofas to form an inviting lounge for a large group. The surrounding planters — filled with trimmed boxwood, pale pink and white geraniums, fragrant confederate jasmine and a small tree — encircle the seating area, enhancing the pleasant feeling of enclosure. 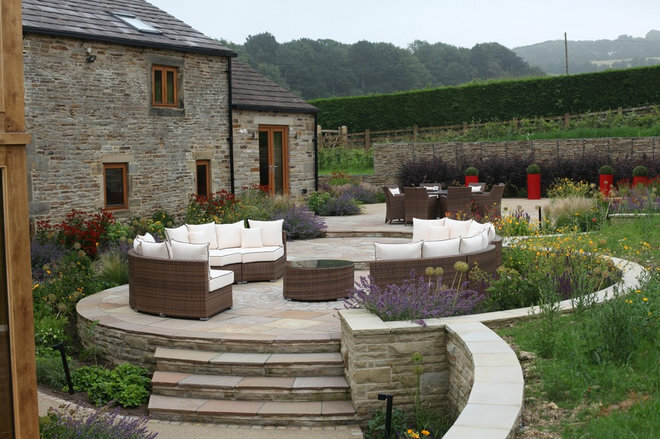 This garden in Sheffield, England, achieves a similarly intimate feeling in a large space with two semicircular sectional sofas arranged to face each other across a small table. This is a great spot to entertain guests on warm summer evenings. Lowering the ceiling of an outdoor room can make an open area feel less exposed. In this backyard in Marin County in Northern California, a movable shade sail set on wires provides cover from the sun and makes the space feel more intimate.Other ways to lower the ceiling of your outdoor room: Build a pergola, plant trees to provide a leafy canopy or hang crisscrossing string lights overhead.